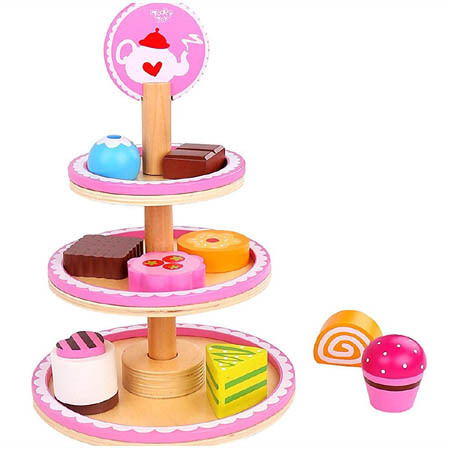 Wooden Toy Cake Stand is a beautiful pink creation that will form a perfect centre piece for all those wonderful tea parties. This wooden play set has 3 levels and 9 scrumptious cakes, each a different shape and each differently designed. The cake stand will need some adult assembly but fear not it is very very simple even for the most DIY challenged. This play food toy is a wonderful way to encourage roleplay and the 9 cakes can be counted, sorted onto different levels and pretend eaten. We like this because: "A perfect pink creation for all those parties with dolly and teddy. "